Herbicides, fungicides and pesticides are important products for landscaping and horticulture. Due to their toxicity they can pose serious environmental threats and occupational hazards if stored, handled or transported improperly. When storing herbicides, federal and state regulations must be met to remain compliant. Follow the guidelines below for safe herbicide storage in your facilities. Herbicides must be protected and stored away from work areas in a compliant chemical storage building, and locked when not in use. Chemical containers must be elevated with a spill control pallet, accumulation center or placed on shelving. Storing herbicides and chemicals alike, inside a chemical storage building will increase the material’s life and prevent any hazardous leaks or spills. When storing herbicides inside a chemical storage building ensure that each building is equipped with a dry chemical fire suppression system, mechanical ventilation or natural ventilation, shelving if storing small containers, and temperature controls. Climate controlled chemical storage buildings are necessary to provide protection from temperature extremes. 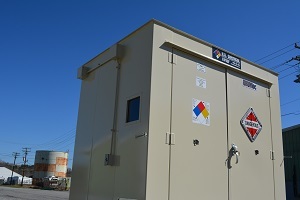 Chemical storage buildings must have a leak-proof sump that meets EPA regulations. Chemical storage buildings used to store herbicides should be posted with placards and signs to warn employees, workers and emergency responders with the presence of herbicides or other hazardous materials. When handling herbicides and pesticides PPE can vary depending on the material’s use, the amount of material being used, and the hazards associated with the specific chemical(s). Impervious coveralls, nitrile gloves and eye protection should be worn when handling, transferring or mixing herbicides or pesticides. Spills, leaks or dripping chemicals must be attended to immediately. Any spill or leak must be cleaned up immediately with absorbent materials. Used spill clean-up materials must be treated as hazardous waste and must be collected for disposal accordingly. In the event of an emergency including direct skin contact or eye contact with an herbicide chemical, flush affected area with water for at least ten minutes. Contact a supervisor and or emergency medical assistance immediately. To receive a free chemical storage consultation contact US Chemical Storage online or call 1-800-233-1480.